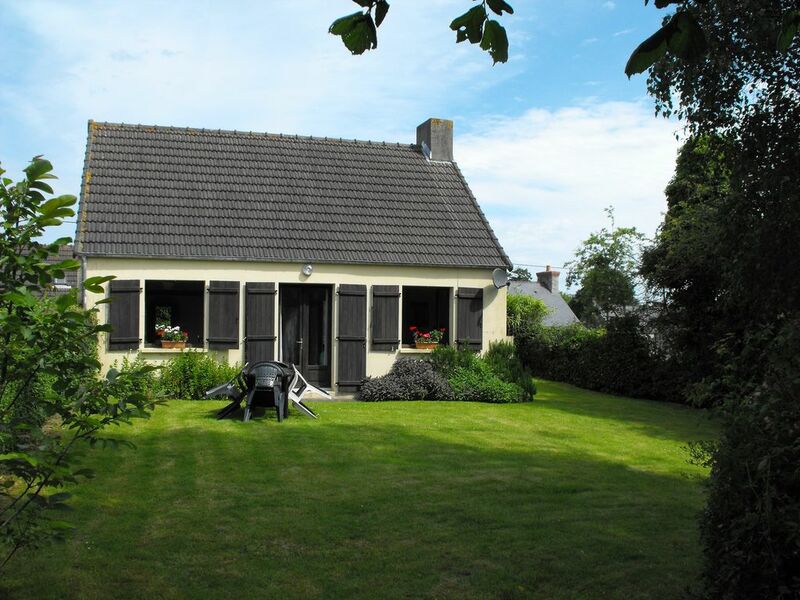 Trois Centimes is a bungalow of the traditional style of the region, situated on the outskirts of the village of Bricquebec on the Contentin peninsula, about 20 km south of Cherbourg. Bricquebec is a small French market town of mediaval origins. The Cotentin peninsula is very rural and agricultural, well known for its dairy produce and particularly for its cheese, cider and calvados. Its coastline provides many types of seafood, shellfish and lobsters. There are many good beaches all around the coast which range from high cliffs in the northwest to long sandy beaches at the base of the Peninsula. The nearest beach is about 10 mins by car. There are also small, picturesque fishing ports. Good size lounge with dining table. Open fire place. Fully equipped kitchen/diner. Cooker, fridge freezer,microwave. Ample cupboards. Fully equipped for 4 people. Golf course within 4 miles. Lake fishing in the village and sea fishing, mainly sea bass type fish at any of the local beaches. Notes on accommodation: Both bedrooms have fitted carpets and the other rooms have 'carrelage' floors. Cooking is by electric cooker or mircowave oven. There is an electric fridge/freezer and hot water from a large attic storage tank with immersion heater. There are electric convector heaters in all the rooms and an open "cheminée" for the winter. Outside: South facing garden, paved patio, garden table and chairs, BBQ, ample off-road parking. The cottage is placed well back from the road. Cleaning / Towels / Linen / Maid service: Visitors should provide their own bedlinen and tea towels. Also towels for the beach and in the house. Good to hear that you enjoyed your stay at our little house. We love it there ourselves and visit it as often as possible. As you say it is in a lovely area with so much to see and do that we are still finding after having the house built over 30 years ago. AND of course the sea is just a 10 minute drive away, miles of golden sand and hardly a soul on the beach even in August. Do hope you will be going back to the house in 2017. This is a fabulous cottage which is situated very close to town. Easy to get to from Cherbourg, we enjoyed a week in this very well equipped, clean and comfortable cottage with a lovely, large private garden. There are old railway lines which you can walk or cycle along, many restaurants that offer excellent food, local ciders/wines etc. Shops and supermarkets are within easy walking distance. There are several quiet, sandy beaches a short drive away. The town has a busy market on a Monday - basically a perfect get away for a relaxing holiday. Will definitely be visiting again! Lovely cottage in the village of Briquebec. This is a small village with a few restaurants, a lovely forge restaurant in next village. A chateau that's beautiful and a lively market on Mondays. There is a super bakery just down the road and a supermarket just around the corner. Everything here for a week or so of relaxing holiday. Lovely family kitchen/breakfast room. Living room with open fire (good for those cooler nights). Light and airy main and twin second bedroom. Off street parking and lovely garden to relax in at the end of a busy day at the beach which is only about 10/15 minutes on really quiet roads. Kick off your shoes and let down your hair, relax away from it all -TRUE BLISS! Thank you for your lovely review, It's always good to learn that our guests enjoy their stay at our little house. We think that the whole area of the Cotentin Peninsula is quite magical, a real "step back in time" and we hope that all our guests will love it and the house as much as we do. Nearest beaches are approximately 8 miles away, ie 10/15 minutes by car. We have some contacts with agencies which may be able to obtain reduced ferry fares. Contact us about this. Cottage stands on the entrance to a mediaeval village. Nearest shops 500 yds. Bayeux 20 miles, Caen 30 miles. Normandy Landing beaches all round. Cherbourg 18 miles. The climate is basically "Channel Island" type. There are numerous Chateaux, Abbeys and other buildings of character and museums on various subjects, e.g. cider making, brass and, of course the Normandy D-Day landings. Slightly further afield, but easily reached in a day by car, are the Bayeux Tapestry, Port Winston at Arromanches and Mont St. Michel. There are many eating out places nearby at a wide range of prices from expensive hotel restaurants to small, family run establishments offering excellent value for money.